Richard Hirst. Bespoke Building & Maintenance: Scan Anderson 4-5 wood burning stove. Rebuilt chimney breast. Slatehearth. Scan Anderson 4-5 wood burning stove. Rebuilt chimney breast. Slatehearth. Removal of what at first appeared to be a simple stone facing. Turned out to be a little more than that. Shortened blocks on the right soft cast concrete on the left and a cast inplace concrete gather. 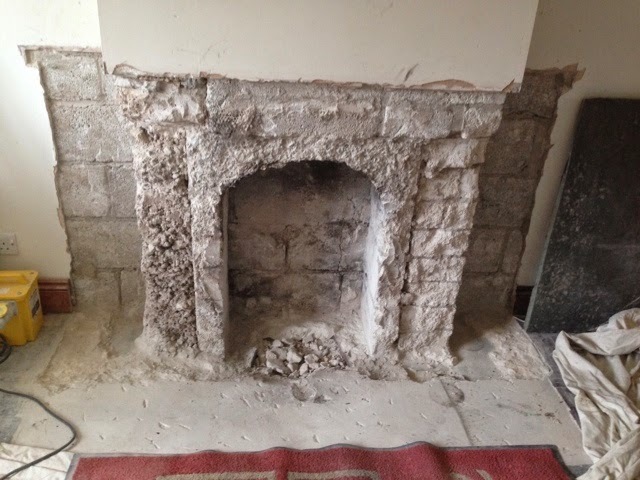 Everything below the plaster was removed and rebuilt in concrete block with new lintel. Reclaimed slate hearth fitted. 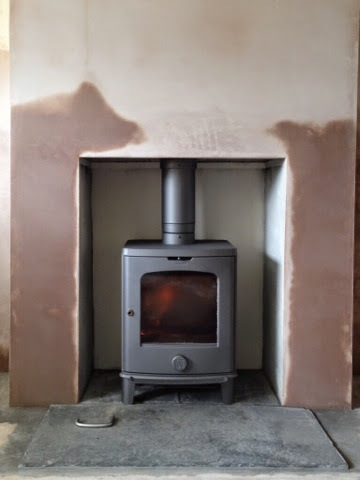 Scan Anderson 4-5 wood burning stove in metallic grey.